Back row from the left: Norman Horsley, Ian Blackwell, Albert Roslyn, John Roberts, Brian Gent. 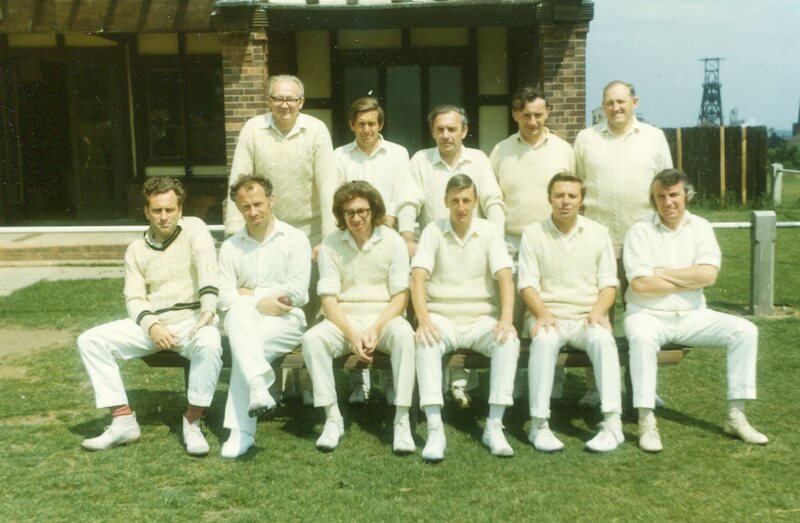 Front row from the left: Bob Angus, David Taylor, Stan Eves, Webster ?, Norman Frith, Les Bresnan. Great memories. Great picture. And what a team!! It’s a pity the photographer didn’t mention to Les Bresnan that this image would be published on the Internet, available for viewing in perpetuity and that, maybe, he ought to sit up straight…..
‘Semper eadem’ and best wishes to all OE’s. 2. Is the school still open today? The line up is, back row;Horsley, Blackwell, Roslyn, Roberts, Gent. Front row; Bresnyn, Frith, Walker, Eves, Taylor, Angus. Thank you for posting this image. I attended QEGS 59-67. Brings back great memories. Trum once gave me 1760 lines of one homework for which he gave me 7/10!!! I played first team hockey ( left back) in the 6th form. Does anyone know how to get in touch with any remnants of the Old Boys Association? Tried the Academy which regrettably has been a waste of time. Norman Frith is alive and well living in Berry Hill. I played football with Stan Eves for the OEs Old Boys for many years between 1979 and the late 80’s. He never missed a penalty and a little known fact is he played European Football when he lived in France! I captained the school cricket team against the staff in 68 or 69. I can’t remember if we won but I do remember setting our best catcher on the square leg boundary in front of the pavilion for Dave Taylor which he fell for and was caught out. Mind you, he had scored a few runs by then! Good to see Stan Eaves in there who coached the first team at football very well. Norman Frith was a top guy as well – made Chemistry interesting which was an achievement. Trump was not so nice and made French a misery! I wonder how many of these teachers are still alive? Strange to see the colliery winding gear in the background – we went there to Sherwood Baths for swimming lessons. I loved QEGS and still get back to Mansfield from time to time for the occasional Stags game. Anyone know if the school do any kind of reunions? I remember playing this lot. Between the two spinners Inky Blackwell and Mr Music Bresnan I’m not sure I put a bat on ball in 3 matches. Attended QUEGS 1946/51. Great to see photo of Albert Rosslyn. Albert taught us German. Still picture him standing by a window, chewing his red & green striped tie, one hand hanging on the window opening frame with a big bunch of keys ready to launch if you got either vocabulary or translation wrong. Remember the whole school had a panoramic photo taken about 1947. Any copies around? At QE 1946/1952! I’ve put a photograph on under QEGS showing a younger version of Mr. Horsley. This brought back some memories! I think this was taken earlier than 1974 though – probably around 1970 I think, as both Norman Horsley and Lesley Bresnan had left by 1971. Garry, funny to see your comment about a Dave Taylor face slap and about Norman Frith being a nice guy, because ‘Frithy’ once smacked me with a face slap. He was a really great teacher and I’m not complaining, bmber that smack as well as his Physics lessons and the experiments we used to do! (e.g. those old Nuffield ticker-timers for measuring acceleration using wooden cars…). On his right is ‘Wild Bill’ Walker, history teacher. And I still have my Art book from lessons with Mr Blackwell. It contains such gems as a Stags player volleying the ball into goal for one of the weekly painting homeworks. Can’t throw that away. “Take me bak ‘ome” as Noddy Holder used to scream! Even though I am pushing sixty now, I can still smell the fresh cut grass, . . . and the stink of liniment and the rotting heaps of cuttings dumped around the place too.
. . . and 7 pint cans of Mansfield Bitter! Only just found this and it takes me back. I was introduced to Mr Blackwells ear-rubs – Dave Taylors variety of encouragements- Nag Horsley ruler chops – Stan Eves giving me lines – Bert and Norman just scared me into submission. Bob Roberts, top man …never actually cracked me one. BUT… I wouldn’t have gone anywhere else. I was at Qegs 1964 to 1971 and am sure too that your description of the front row is in reverse order because I recoginise Stan Eves who was my French teacher. I remember Nag too (Norman Horsley). At 57, it’s still one of my greatest achievements that I captained the School First XI to victory over this Staff team in the annual match. I think the photo was probably taken in 1974(?). Thanks for posting! Hi Ian! Good to see this photo after so many years. I agree with Nigel – the front row is back to front. I remember almost all of these teachers – some real legends amongst them! Hope many of you are still around! Ian, thanks for teaching me art. I remember doing lino block printing and you had this trick of licking the palette knife with printers ink on it. Being waterproof ink you never ate any. Had me fooled for ages before I worked that one out. Thanks for posting this, Ian (I think you taught me art!). This photo brings back some memories! I remember all these teachers from my time at QEGS (1967-1974). I think, however, that you have got the front row back to front as I am sure that Les Bresnen is on the far left rather than far right. By the way, when was this photo taken? The front row names are in reverse order (i.e. they actually read from right to left). If I remember correctly the “?” is history teacher named Walker.